Discover this unique tour route and enjoy visits to Nanning, the Detian Waterfall, Tongling Grand Canyon, Bama and surrounding areas. 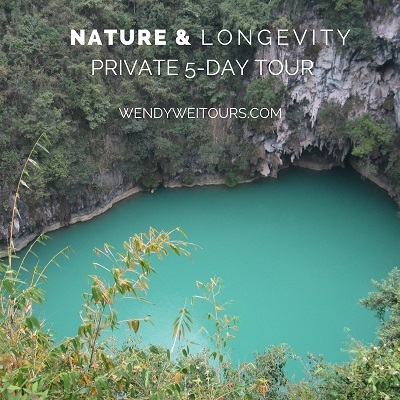 This private tour is a tour of a number of highlights and off the beaten track destinations South-Western Guangxi Province held over five days and four nights with your own experienced Wendy Wei Tours local guide. Visitors stay in different places throughout the entire tour. This tour consists of full days with flexibility for times. Arrive into Nanning the day before your tour is scheduled to begin or alternatively, activities/itinerary/day order can be changed to reflect your arrival time. Begin the day by visiting Qingxiu Mountain to explore one of Nanning’s most famous attractions – a large park within the city. This park features sculptures, temples, gardens, lakes and more to enjoy. Following your visit to Qingxiu Mountain, depart Nanning and travel towards Daxin. On the way, to break up the journey, stopover at the small city of Chongzuo and visit it’s leaning pagoda. Chongzuo is surrounded by karst scenery, rivers and sugar cane fields. After Chongzuo, continue south towards Mingshi – a scenic spot famos for it’s incredible landscape. It’s known as a ‘small Guilin’ and visitors will stay overnight in Mingshi. In the morning, explore Mingshi Scenic Area before travelling to the famous Detian Waterfalls. By staying overnight in Mingshi (and departing to the waterfalls earlier), the majority of the day visitors from Nanning won’t be at the waterfalls during your visit, allowing a more peaceful experience. The Detian Waterfalls are famous waterfalls straddling the border of China and Vietnam and Detian is the fourth largest waterfall in the world along a national border. During the afternoon, depart Detian and stopover at the Tongling Grand Canyon – a spectacular canyon surrounded by lush scenery and with one of the largest waterfalls in China. Spend the evening at leisure in your hotel in Jingxi. Depart from Jingxi and travel towards Bama – stopping over at Baise town to break up the journey. In Baise, visit the Baise Uprising Memorial Hall to learn about the history of Baise and Guangxi Province. Following the visit to Baise, continue travelling towards Bama and upon arrival, visit Bama Longevity Village. The Bama Longevity Village is famous for being home to a large number of ‘centurions’ living there. Discover the secrets and explore the village before staying overnight in Bama. Today, the highlight will be the visit to Sanmenhai National Park (also referred to as the Leye-Fengshan Global Geopark). Explore scenic rivers, caves and sinkholes in an incredible national park, which is well off the beaten track for international visitors. Your time at Sanmenhai will take up the vast majority of the day as the park is large and very impressive. In the late afternoon, return to Bama and embark on a relaxing rafting experience along the Panyang River. Enjoy the evening at leisure in Bama. Begin the day with a visit to Baimo Cave – featuring an incredible maze of stalactites as well as a natural spring. After checking out from the hotel, depart Bama and travel towards Nanning. In the evening, explore the Nanning Night Markets and taste a variety of different foods both local and national along the popular eating streets. The tour will conclude upon your return to your hotel in Nanning.